Jon Agee, London: Scallywag Press, hb, 978 1 9126 5004 0, £12.99, 2019, 48pp. 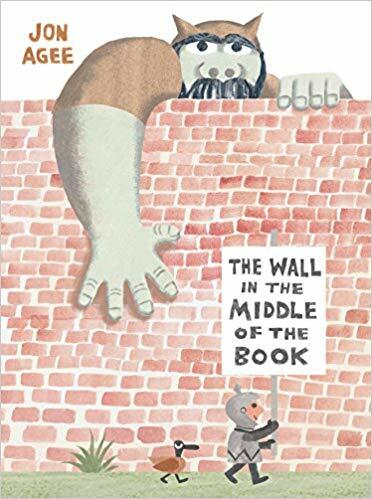 The little knight is essentially happy mending a hole on his side of the wall, but when danger overcomes him he sees things in a different light and finds the other side of the wall has much to offer after all. The endpapers in this book tell us that this is ‘a book that celebrates freedom of movement and thought’. It certainly does this and uses the gutter beautifully as a barrier on which to base the story. Agee has used this device as a way of highlighting this impenetrable barricade where the main character thinks he is quite safe on his side of the wall, but we soon come to understand that all is not as it seems. The story asks unstated questions. Why is there a wall? Is the other side of the wall better? What or who is on the other side of the wall? Is it safe on this side of the wall? Is it wise to pre-judge people? It looks at issues such as kindness, that people are essentially good and not who they may first seem, and that there are often different ways of looking at the solutions to problems. Agee cleverly uses the white space of the left hand, double page spread to add tension as the danger grows, whilst keeping the messages contained within the text highlighted against a muted tonal palette throughout. This is a delightful book that would make essential reading in a primary classroom where the various messages that emanate from it might form the basis of hours of discussion and activity.